This is a classic image of a "halo event," so called because the circular area of the edges of the blast seems to form a kind of halo around the Sun. 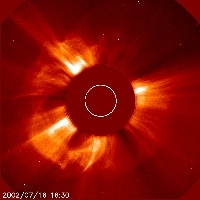 In the image taken by LASCO C2 on 16 July 2002, one can observe particles blasting out from the Sun in almost all directions. Since this particular event had its origin on the backside of the Sun, the material is streaming away from us here at Earth.